Amit Bhargava for The New York TimesSchool students at a sit-in protest against the economic blocade imposed by Naga rebels, near Imphal, Manipur in this Aug. 3, 2005 file photo. In the second of a three-part series, a journalist from the Northeast examines the peace that is quietly breaking out across the once strife-torn region. 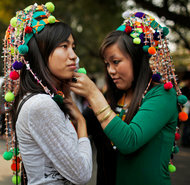 Northeast India is part of one of the world’s last great ungoverned spaces. The wider region it inhabits has a name, given to it in 2002 by a Dutch professor, Willem van Schendel: it’s called Zomia, derived from the word Zomi, which means ‘‘highlander’’ in several of the languages spoken here, as Frank Jacobs wrote recently in The New York Times. The original area was defined as extending from the highlands of Laos to Tibet. All of Myanmar and most of Northeast India are a part of this area, inhabited by people who have traditionally been outside the control of whatever government technically controls the land they live on. The Yale University political scientist James Scott theorized in 2009 that these “highlanders” remain unassimilated because they reject modernity, Mr. Jacobs writes. Perhaps some of them do, but I suspect the majority actually have no issues with modernity per se. I was born and grew up in Northeast India and I’ve seen the hunger for a better life as it is popularly understood in most places. I know the love for branded clothes, and the desire to shop in malls, which are mistakenly seen by locals as symbols of development. The battles here are not against modern lifestyles. They are against loss of ethnic homelands and rule by outsiders. Given enough political autonomy over their areas, most of these peoples would gladly join the modern, globalized world, if changes here in the past 20 years are any indication. 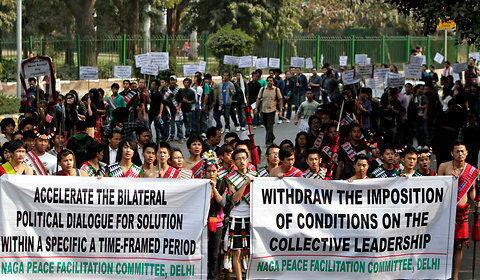 Mustafa Quraishi/Associated PressEthnic Nagas from the northeastern state of Nagaland participate in a rally urging the Indian government to expedite the India-Naga political dialogue for a positive solution, in New Delhi, Feb. 24, 2012. Her views reflect a new mindset in a region where the major conflicts have long been about separate identities and homelands. The average Indian from the mainland has nothing in common with the average Naga, for example: No shared history in roughly 5,000 years preceding British rule, no shared culture, no language or religion that binds them. Kevin Frayer/Associated PressEthnic Naga women in traditional clothing at a rally urging the Indian government to expedite the India-Naga political dialogue, New Delhi, Feb. 25, 2012. It is little surprise then that many Nagas see themselves as different from Indians. This feeling of difference was recorded well before India became independent, in the Naga Club’s memorandum to the British Simon Commission in 1929. It subsequently led to the Naga insurgency. The Naga tribes inhabit several areas of northern Myanmar as well. The chief of one wing of the powerful National Socialist Council of Nagaland, an insurgent group, is S.S. Khaplang, a Burmese Naga. Naga politicians in India are quietly forging their own links to Myanmar. With a nod from the Indian and Myanmar governments, the current chief minister of the state of Nagaland, Neiphiu Rio, has reopened his state’s border with Myanmar and started facilitating free movement to and from the Naga areas there through jungle routes. “The daily movement of Naga villagers across the border for jhumming (a kind of farming) and other activities is a necessity,” Mr. Rio said at an international conference on Myanmar at Jamia Millia Islamia in Delhi on Jan. 30. It is a hint of the way forward in this part of the world, where borders split not only ethnic groups, but even families. Nona Arhe is the author of a new book published with support from the Nagaland government on the Nagas of Myanmar, titled ‘‘As It Is.’’ A Naga herself, Ms. Arhe traveled several times to Myanmar to document the life of the tribe there. She found a people living primitive lives. Yet, even in these remote reaches of Myanmar, she met Naga students who regularly went back and forth across the border with India without identification documents. “There were even some who had studied in Bangalore,” she said. Previous: A flurry of activity between the Northeast and Myanmar is a sign of strengthening foreign ties in the area. Read the article here. Next: Some hurdles still remain to the Northeast’s transformation.